More than 30,000 homes and businesses in Massachusetts remain without power two days after a violent nor'easter brought blizzard conditions to the state. More than 30,000 Massachusetts utility customers remain without power two days after a nor'easter brought blizzard conditions to the state. Most of the outages were on Cape Cod and areas south of Boston, where winds were highest. Other New England states were still reporting scattered outages by Thursday morning. More than 30,000 homes and businesses in Massachusetts remain without power two days after a violent nor'easter brought blizzard conditions, two feet of snow and hurricane force winds to the state. State emergency management officials reported about 32,000 outages on Thursday morning, most of them on Cape Cod and areas south of Boston, where winds were highest. Most of those without power are serviced by Eversource. The utility tweeted Thursday that it hopes to have electricity restored in the New Bedford area and Martha's Vineyard by midnight Thursday. 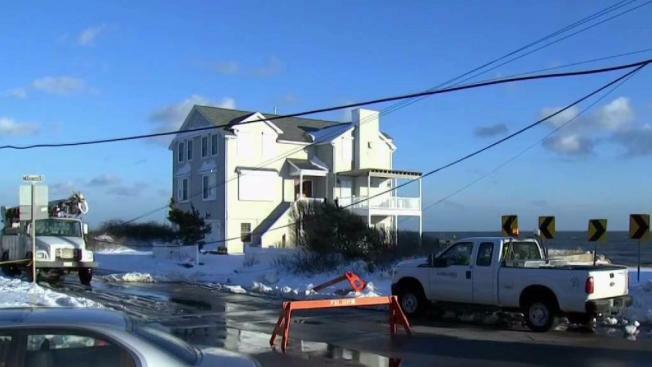 It also said the goal is to have power restored in Plymouth and Cape Cod by midnight Friday. As many as 250,000 homes and businesses were without power at the height of Tuesday's storm. Other states were still reporting scattered outages.